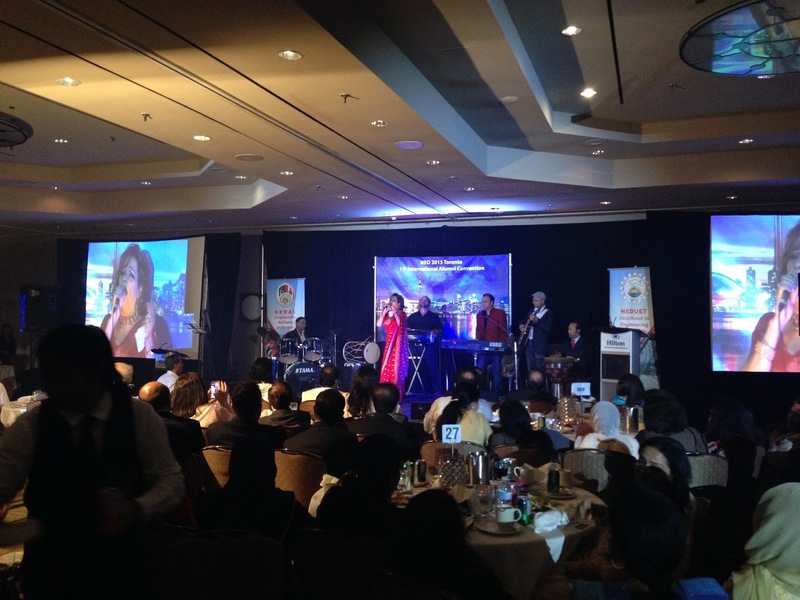 Over 600 NEDians and their families from all over North America and other parts of the world converged on Toronto to attend the Karachi-based engineering university's 11th international alumni convention for the year 2015. 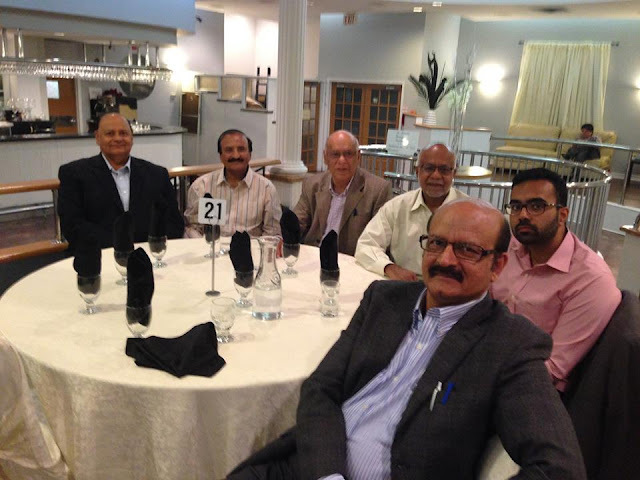 It was organized by the NED Alumni Association of Canada over the Labor Day weekend (September 4-6, 2015) at the Mississauga Hilton. Last year, the NED Alumni convention was held in Silicon Valley, California. Next year's convention will be held in Houston, Texas. My wife and I were met by Pakistanis from the moment we landed at Toronto Pearson International Airport. Our first encounter was with a Karachi-born Canadian immigration officer. Our taxi driver who took us from the airport to the hotel was a Sikh gentleman. The manager at the hotel was a Pakistani as was the man minding the gift shop there. What impressed us most was how "desis" from South Asia were very responsive and well organized in performing their jobs, a far cry from how badly the same people do the same things in their countries of origin. It's a tribute to the efficient systems put in place and operated in Canada. Rule of law is a big part of it. Mississauga in Peel region of Greater Toronto Area is an excellent choice for any gathering of Pakistanis in North America. 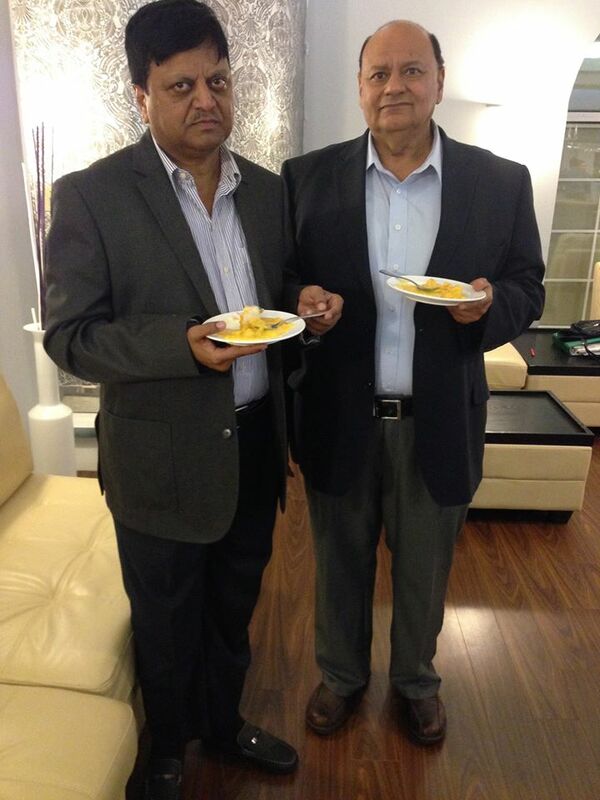 It has a large number of people of Pakistani origin with a strong support system. There are over 30,000 Pakistanis in Mississauga making up the second largest immigrant group in the city, according to Canadian Census Data from 2011. 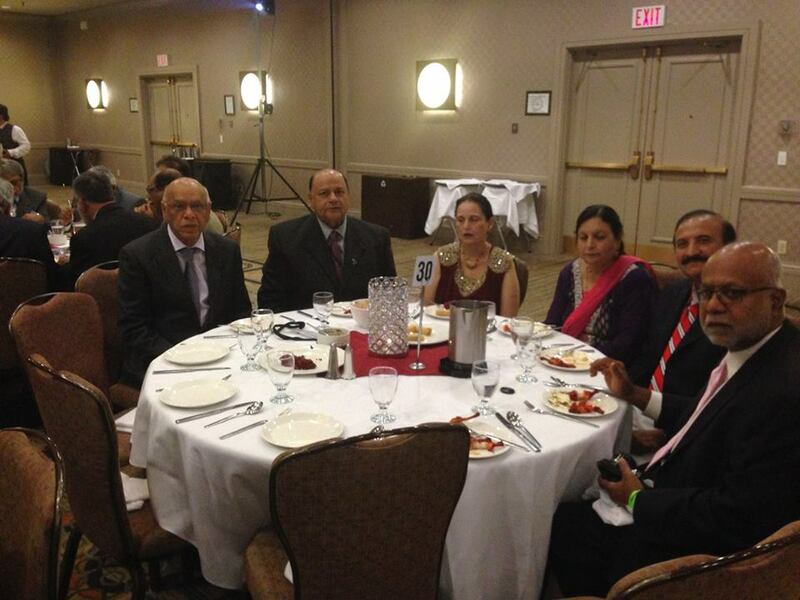 Alumni coming in from outside Toronto area were treated to Chinese food and Pakistani poetry and music at Symphony Event Center & Banquet Hall, one of many Pakistani-style shadi halls dotting the Peel region around the airport. It was a great opportunity to meet lots of friends after many years. Some were from 1974, the year I graduated. My wife met some of her Dow Medical College (DMC) alums who are now married to NEDians attending the event. After continental breakfast and a brief welcome speech by President Imran Ahmad of NED Alumni Association of Canada, there was a panel discussion on a very hot topic for most Pakistan: the energy crisis. Mr. Arif Alauddin, Dr. Khurshid Qureshi, Dr. Asad Asghar, Dr. Afzal Haq and Mr. Tanveer Zuberi were on the panel. The people on the panel all have impressive backgrounds but the the content and the quality of the discussion left much to be desired. Panelists focussed mostly on engineering and manufacturing while ignoring major policy issues that are mainly responsible for severity of the crisis. For example, panel members looked for solution to the crisis in engineering and manufacturing solar panels and turbines while saying little or nothing about the serious policy issues ranging from badly crafted IPP power purchase contracts to impact of fuel costs, lack of incentives for generation efficiency, and extremely poor financial management of the entire energy sector. Dr. Afzal Haq discussed the precarious financial situation of the university and how he is trying to fix it. Dr. Haq inherited a significant debt running in hundreds of millions of rupees when he took over as the Vice Chancellor of the University. Much of the money was borrowed from commercial banks at high interest rates. He blamed it on heavy political patronage-based hiring of non-faculty staff who he could not easily fire. He did reduce the staff to some extent and then turned his attention to raising more revenue. One of the ways he's done that is by adding self-financed seats filled by those who pay significantly more than the standard tuition for the privilege of attending NED University. He's also added more graduate classes in the evening for working engineers who pay more. Dr. Haq has so far cut NED's debt in half by these measures. The Saturday banquet drew the largest attendance. It was well organized with good food and great entertainment. The only complaints I heard were related to the length o speeches and other presentations that took time away from people wanting to spend more time meeting friends and families. The 2015 NED Alumni Convention went very well except for some minor irritations. The NEDians in Canada deserve full credit for pulling off the largest ever NED Alumni Convention in the last 11 years. Hope the 12th international NED alumni convention in Houston , Texas, will be even bigger and better. I think my fellow alum Afzaal Hafeez is quite capable of delivering it. NED pale in comparison to Mumbai University! Peel region is a regional governance system. Nice to know many Paaistanis experiencing what living in such a system means. Thanks for sharing it.Good picture and write up.Pictures I have seen on FB also.Good you people are actively participating in such conventions.What is surprising is that very few of our class friends are seen in these events.Same 5/6.Any reason why others do not join in.Is it lack of information? Najam: "What is surprising is that very few of our class friends are seen in these events.Same 5/6.Any reason why others do not join in.Is it lack of information?" Some of us take time out to travel long distances to attend NED alumni conventions in different cities in this vast land. Others do it when they can when it's close to home and convenient. There are a few of us who are too busy to attend such events regardless of location and time. Why do you guys have to compete with pakistan in every matter. It shows your inferiority complex against a nation that ruled over you for more than a millennium. And zeeshan you say something different. And arab and turk and parsi and pakistan all are muslim but not one.correct your history. What is the specific mission and vision of these conventions? I thought deep and hard. Part worried that unless NED conventions had a specific vision or mission people will give up on these events. They would stop sponsoring and subsidizing these events. They would stop volunteering their time etc. etc. Here is what I realized - The NED conventions of the last 11 years have already created a transformation. There are at least 3 different groups who are finalizing the paperwork for an Endowed Chair at NED University and knowing them I am confident they will succeed. There is an endowment fund that is already in motion. There are at least a dozen if not more initiatives of scholarships, project help, online lectures, mentorship, book funds, visiting lectures that are spinning on the side and creating value. People can put ‘NED Alumni Convention” in the Google window and it returns 228,000 results. I recall very well in 2007 when we organized the first SV convention there were a handful of sites that were out there and that also because of the effort of an NEDian who had carefully searched and compiled them on one page. The 11 conventions may be a small beginning but it is an effort worth continuing because from within these events emerge ‘Ideas worth spreading’ (exactly like it says under TED Talks). I think it is wrong to ask why. The ‘why’ is right under our nose – NEDians have spoken not once or twice, they have spoken 11 times across multiple states of the US and now in Canada that NED Alumni conventions matter and meeting fellow NEDians matters. Someone has to be highly cynical and critical to not recognize the power of this movement. My suggestion to them is that they should focus on finding ways to take advantage of these gatherings of NEDians and launch new NED related initiatives, force multiply existing initiatives, find business partners, raise money for new businesses, find employees, help fellow NEDians, etc.